Event Description : MUSIC : Barmer Boys live. 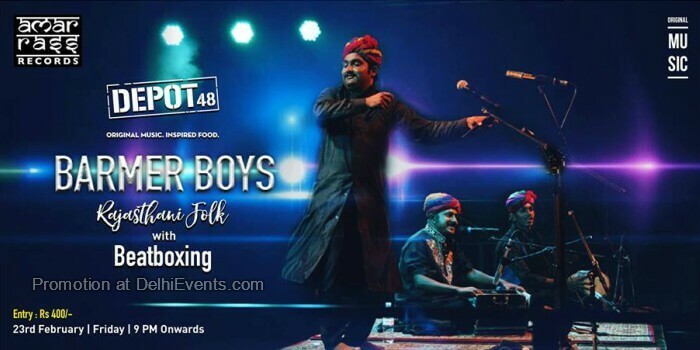 BARMER BOYS (Rajasthan, India) - 'Rajasthani Gypsy Folk with beatboxing' - are the next generation of performers that carry forward the centuries-old musical traditions of the Manganiyars. 'Global ambassadors of contemporary Rajasthani folk and Sufi music', the band's versatility of styles and bubbling energy infuses each performance - from soulful Sufi kalaams to uplifting wedding and celebratory songs, songs of love and remembrance, to boisterous jams with beat-boxing and live DJ sets. The group formed in 2011 at the Amarrass Desert Music Festival in New Delhi, and made their international debut at Roskilde Festival in 2014, and have featured on MTV CokeStudio, BBC and NPR. Barmer Boys second album 'Kesariya Balm' (2017, Amarrass Records, released on Bandcamp/ handmade vinyl in India) debuted on the Transglobal World Music Charts Top 40 this summer, with their debut 'At Home' (2012, Amarrass) receiving 4 Stars in Songlines and Downbeat magazine. The band has performed at major festivals worldwide including Roskilde Festival (2014), Borneo World Music Festival (2014), Wassermusik (2015, 2017), Winnipeg Folk Festival (2015), Distortion Festival (2015), Ziro Festival of Music (2015, 2017), Music Meeting (2015), Feito A Man (2015), Clockenflap Hong Kong (2015), In2Wild Festival UK (2016), Festival 3 Culturas (2017), Stockholm Cultural Fest (2017), Sommerscenen Malmo (2017) and more.